Home / Blog / What Are The Types of Alimony? Not all of these factors must be present or relevant in a case determining whether one party should pay spousal support to the other. Certain factors may be more or less relevant than others. These factors allow attorneys and judges to determine the amount and type of alimony that is appropriate in a particular case. Rehabilitative alimony provides the receiving spouse with support for a period of time that allows for training or education to become self-supporting. An award for rehabilitative alimony can be modified at any point in time by the court at the request of either party. Reimbursement support is ordered to repay a spouse that provided support for the other to obtain an advanced degree. An award of reimbursement alimony cannot be modified for any reason. Although most spousal support terminates upon the remarriage of the recipient, both rehabilitative and reimbursement continue for the entire time ordered. The last type of spousal support is open durational alimony, which was formerly called "permanent alimony" until the law changed in 2014. This type of alimony can only be awarded for those marriages that have a length of 20 or more. Under open durational alimony, there is a presumption that alimony will terminate upon the payor spouse attaining full retirement age, which is defined as when the payor spouse is eligible to collect full social security retirement benefits. Typically, the method of payment of spousal support is done through direct pay (payor spouse to recipient spouse) or through a Probation account, which is set up at the time of your divorce. When and how frequent payment is made varies in each case and is determined by the parties or the court. However, parties can agree to alternative means of payment like lump-sum payment. This is exactly what it sounds like – support paid in one lump sum rather than payments over a period of time. A court cannot order lump-sum alimony - this can only be negotiated and agreed upon by the spouses. 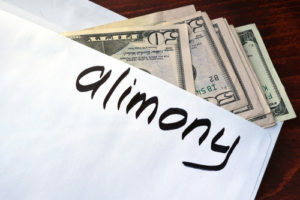 Unlike other forms of alimony, the spouse receiving the alimony is permitted to remarry without the risk of losing alimony. This option may also be appealing if neither party wants to risk having the alimony modified or terminated in the future based upon any substantial financial change in circumstances. In our blog "Modifying or Terminating Alimony After Your Divorce," we discussed several reasons that may give rise to a modification or termination of alimony after a divorce. A lump-sum payment can assist the spouses in truly cutting financial ties after the divorce process. There are many nuances, risks and advantages to each type of alimony. If you are considering divorce, or determining whether your situation lends itself to alimony, we strongly encourage you to contact our seasoned family lawyers at Ruvolo Law Group to assist you in negotiating the types of spousal support and navigating all of your options. Don’t make a costly mistake in your divorce.